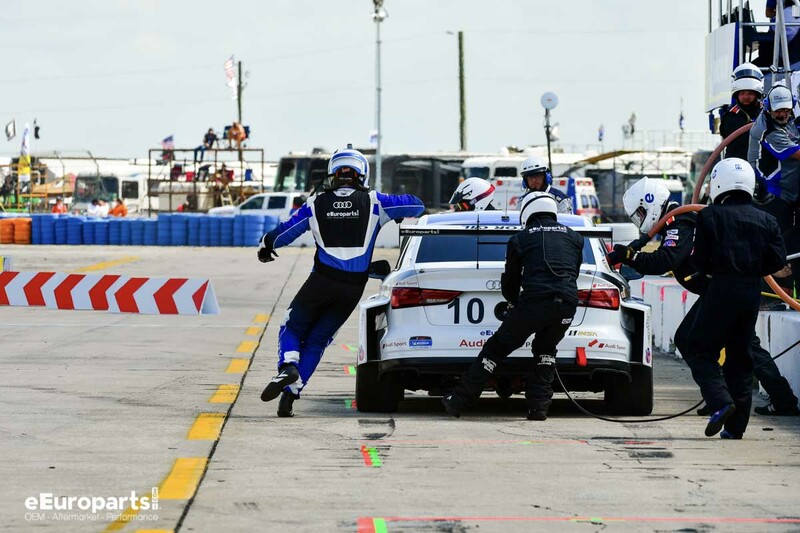 Sebring, home of the quintessential Florida man, is also a mecca for motorsports in the southern region. Many years ago, a large section of an airbase used to train WW2 bomber pilots was converted to a road race track. 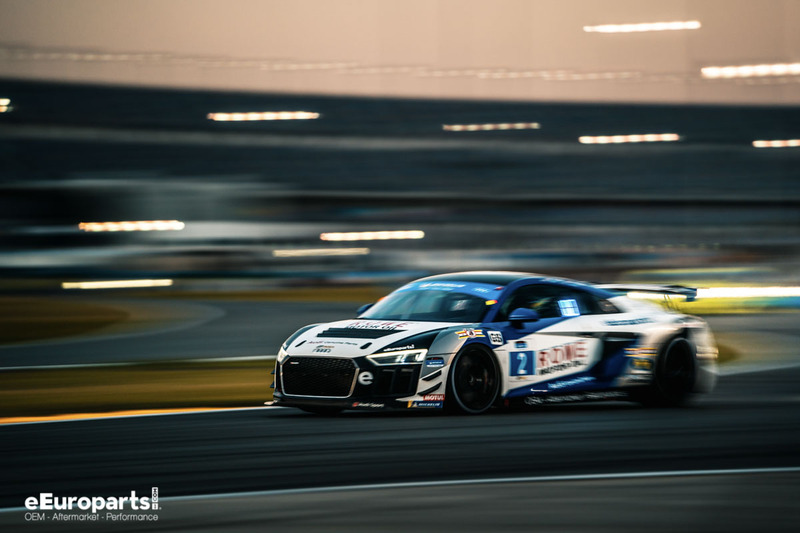 Sebring International Raceway has since gained an enormous amount of traction in the road racing sector, and now hosts one of the biggest events on the 2019 calendar, the 12 Hours of Sebring. 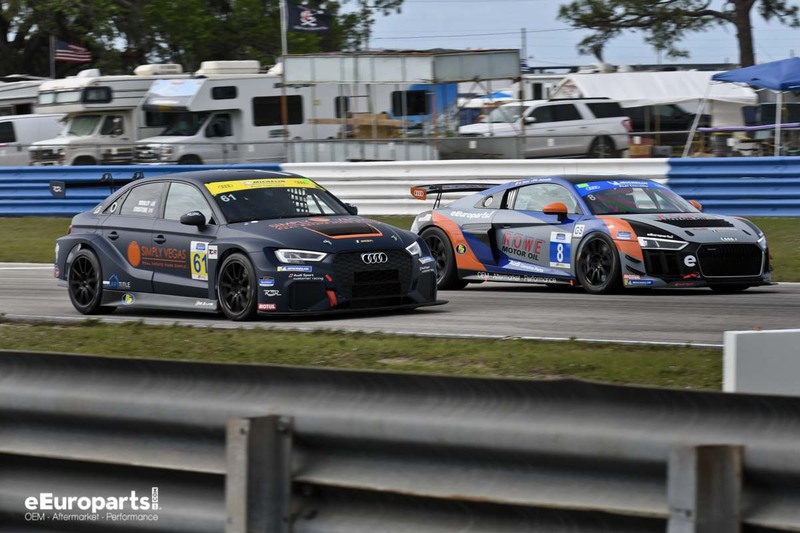 We race alongside the Weathertech series (we also sell Weathertech floor mats coincidentally), and arrived with our two Audi R8’s and three Audi RS 3 LMS’s Tuesday. This week was about to be the proof that hard work pays off. 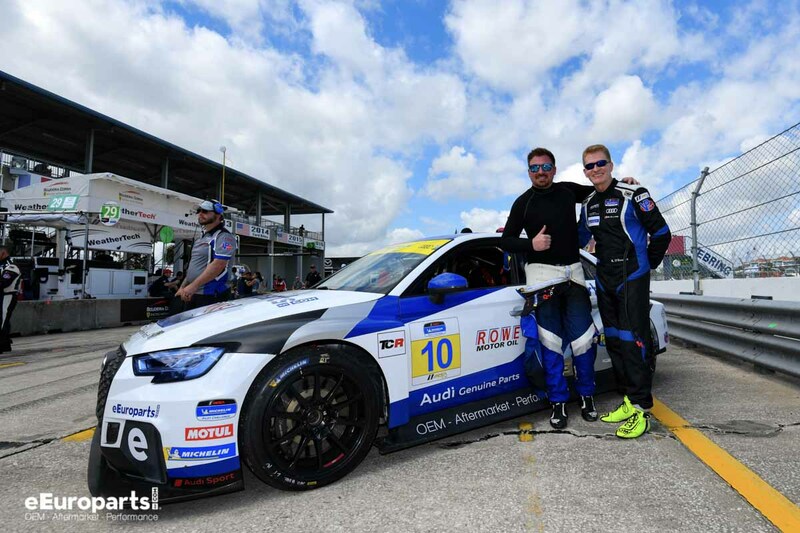 Daytona was tough, and the team returned from the 4hr BMW Endurance Challenge battered, bruised, and with a few heavily damaged race cars. That’s racing, it happens. The drivers and crew we ready to give their all on their return to Florida, and it showed early. 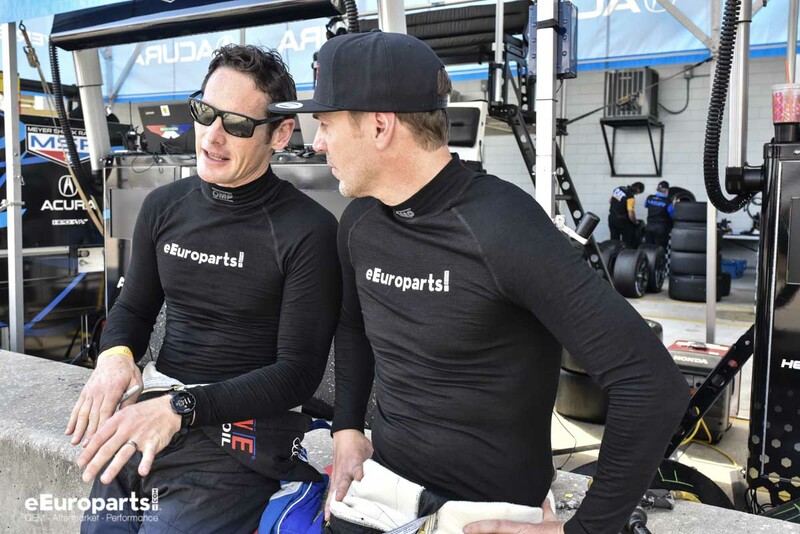 All through practice and qualifying, preparations yielded better results and the large team was up to speed quickly. Remember, this time last year the eEuroparts.com ROWE racing was made up of only a single Audi RS 3 LMS. 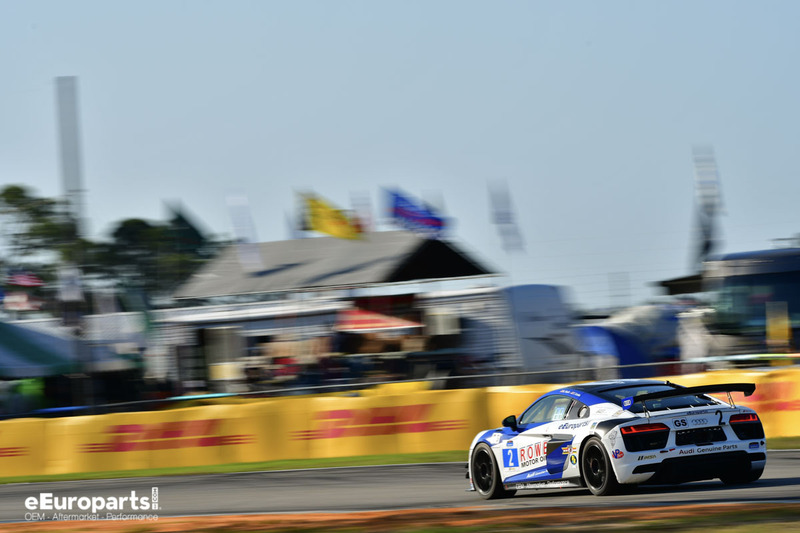 The best qualifying result was with Tyler Cooke in the #2 Audi R8, who was able to piece together a stellar lap. It was good enough for a 5th place starting position in the top GS category. When the green flag fell, a lot of moving parts were set into motion. Engineer Eric Peterson set the #2 on an alternate strategy, coming in after only 15 minutes for a quick fill up. This would stretch the pit stop window out, and Cooke would find himself as high as 3rd. After being overtaken late in his stint on degrading tires, the #2 pitted in 6th place for a perfect pitstop during a brief caution period on track. The stop changed tires, topped off fuel, and dropped Kenton Koch in to the hot seat. He darted for position in pit out and ultimately hung on to secure 8th. 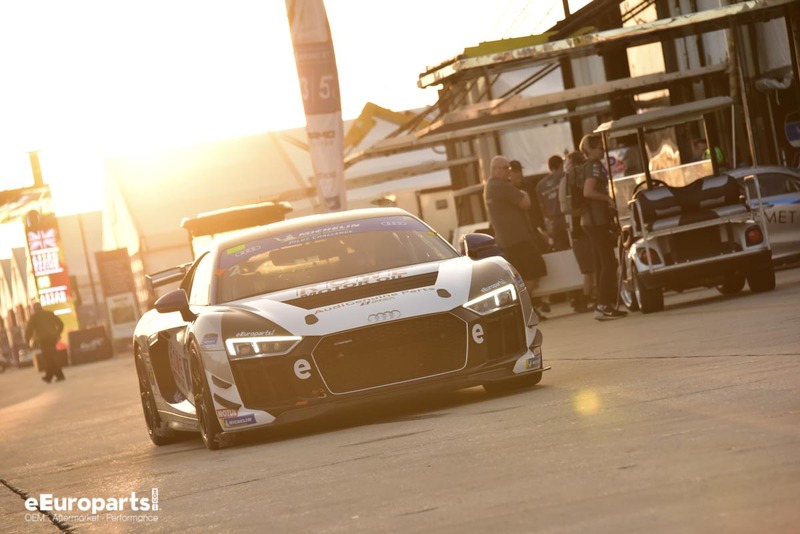 The #8 Audi R8 GT4 started further down the order in 17th due to some bad luck in qualifying. Driver Rodrigo Sales started the race and as the race settled was hit by another car on track, tearing the air scoop off the passenger side of the car. The rear wheel was hit in the process, disturbing the alignment and making the car harder to drive. 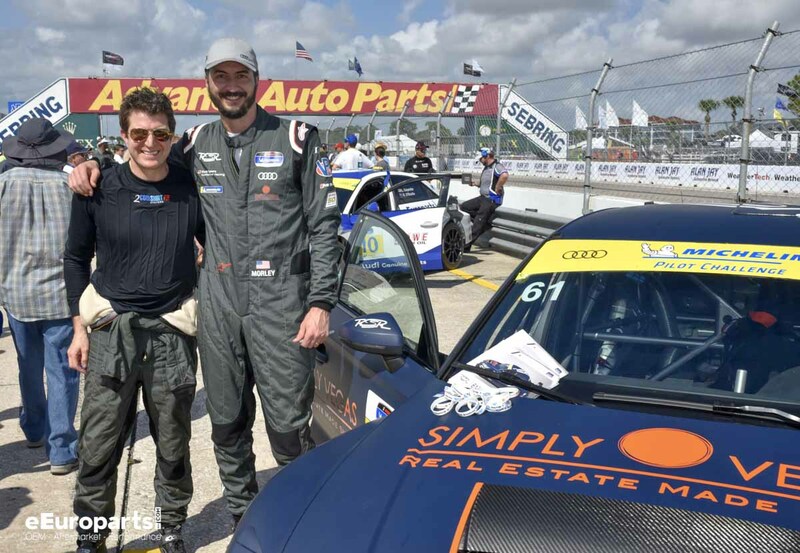 Around 50min in, Rodrigo turned the car over to ALMS Veteran Gunnar Jeanette, who held on to finish 16th in GS out of 28 entries. Starting in 7th place, the #12 was in good position to score points and keep an eye out for podium opportunities. Sometime through the stint, McDonough experienced contact when a competitor turned into his front wheel approaching a corner, resulting in that car spinning. He was able to make it out with minor front end body damage only, handing the car over to Ryan Nash while in 5th position. Despite a flat tire on the very last lap, the #12 secured a 7th place finish out of 14 TCR entries. Kieron O’Rourke started down in 13th place after trouble in qualifying left him far down the order. However, at the start he was able to take advantage of up-track battles and squeeze his way to 8th place. Mid race, O’Rourke swapped out for Lee Carpentier during a green flag pit stop, but an accident on lap 27 would take him out of the race. Through expert driving, Carpentier was able to make a split second decision to spin the car when his brake line was sheared by on-track debris. He rotated the rear of the car into the inevitable collision with the turn 17 tire wall, after the highest speed straight on the track. He walked away shook up but without any injury. Two other cars would have very similar incidents during the race. Ernstone started the #61 in 12th place, after repeated and mysterious electrical issues in practice and qualifying. Unfortunately, their race was defined by these continuing problems. Down on power, Morley finished the race in 10th place. 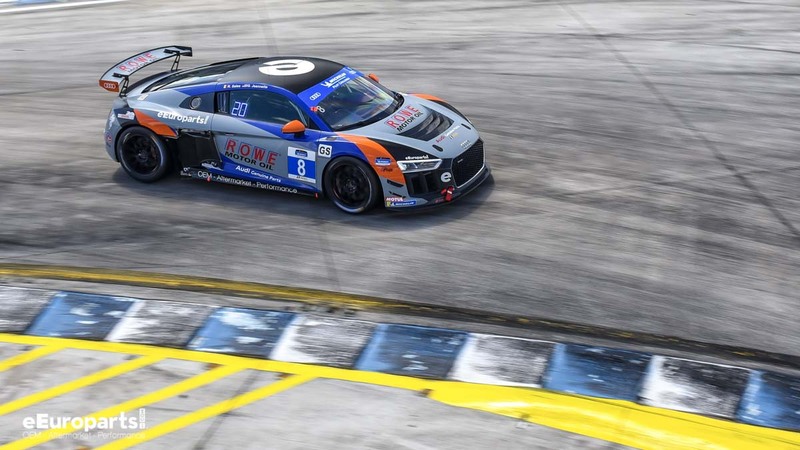 With the mountain of logistics and equipment familiarization out of the way for the new eEuroparts.com ROWE Racing team, focus will now be on learning the subtle intricacies of the new-to-the-team Audi R8 GT4’s. The team will participate in an upcoming test, where the engineers, drivers, and mechanics will work closely together to unlock the secrets of the new and complicated hardware. 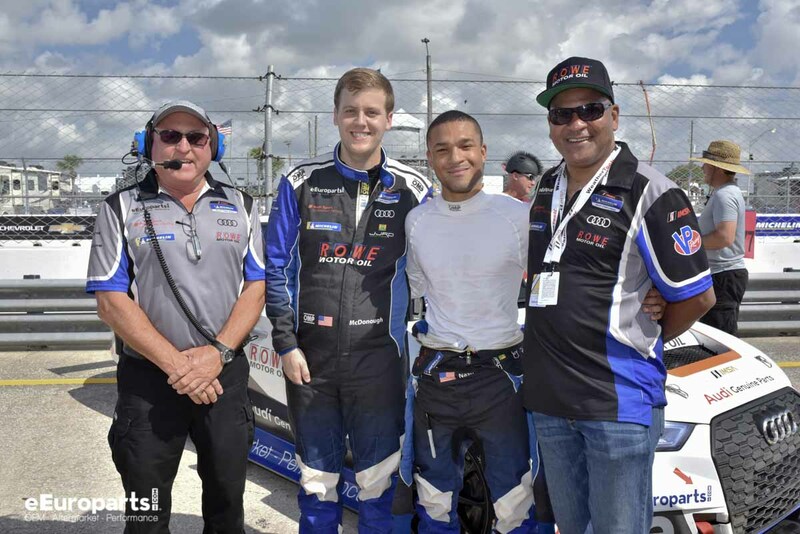 Stay tuned for a replay of the Sebring Alan Jay 120 race on NBCSN Thursday, March 28th 2019. Coverage starts at 3pm Eastern, so set your DVR’s and get ready for some of the highest quality wheel to wheel action available in American motorsports. 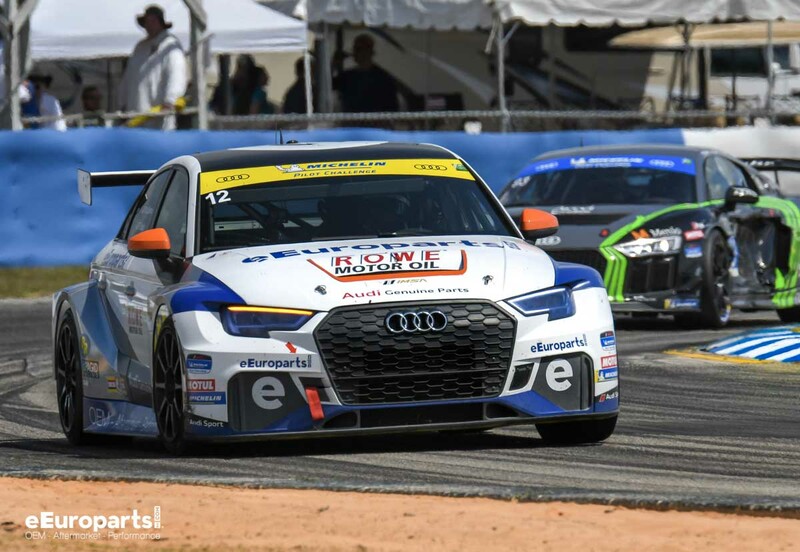 May 2-4 marks the next competition weekend with the IMSA Michelin Pilot Challenge, to be hosted at the Mid Ohio Sports Car Course in Lexington, OH. A fun race to watch, and a good writeup. My only comment is that #12 McDonough was pushing deep into that corner when he didn’t have the line, so of course the other car turned into him. Hopefully he has a little more patience next race! Good luck! I’ll personally let him know. That halfmoon tiremark is pretty far forward huh?